Mongoose Run is a spacious 3 bedroom villa with spectacular views of Bay Rouge, the coastline of St. Martin and the neighbouring island of Anguilla. High up on the "Falaise des oiseaux," in the exclusive residential area of Terres Basses, Mongoose Run is a spacious 3 bedroom villa with spectacular views of Bay Rouge, the coastline of St. Martin and the neighbouring island of Anguilla. Set in beautiful gardens, this villa has a plunge pool and terrace, rooftop sundeck and flowered courtyard. The fully equipped kitchen leads into a living/dining area equipped with stereo, satellite TV. All 3 bedrooms have en-suite bathrooms. 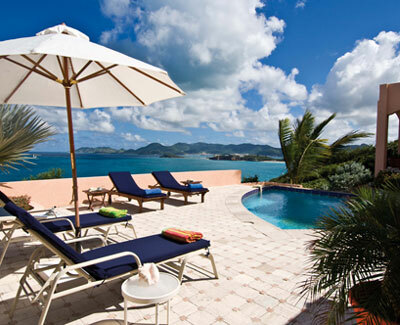 Peaceful and secluded, this villa is only minutes away from St. Martin most beautiful beaches : Plum Bay, Bay long and Bay Rouge.